I have put sound ports in the sides of my dulcimers for a few years and have been very pleased with the results. Sound ports are nothing new in the guitar world but I had not seen them used on dulcimers though perhaps someone has thought of this before. 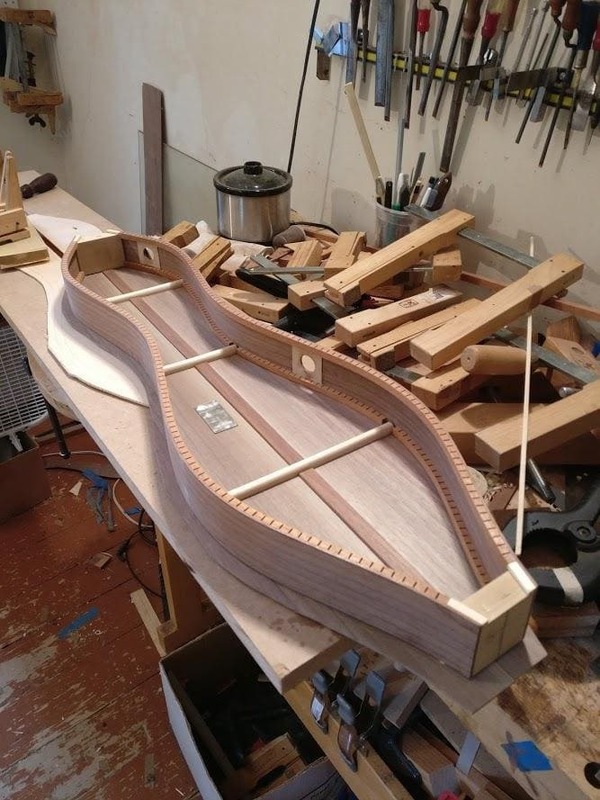 There is no standardization of dulcimer design or “right way” to go about getting the results one wants. Dulcimer builders whose work I admire each have a unique way of getting the sound they want. Materials and design elements that work on one maker’s design may or may not work well on another builder’s dulcimers. This is part of the adventure and part of the fun! My dulcimer design is in a state of constant evolution. Over the last few years I was looking for ways to increase the volume without losing tonal quality and even response along the fingerboard. It is easy to make a loud dulcimer but I do not find it easy to listen to many loud dulcimers I have heard. Many loud dulcimers have little sustain and/or often have uneven volume and response along the fingerboard. The tone I prefer is somewhat traditional; long sustain and a slightly nasal quality with warmth and even response. I did not want to trade that sound for volume. As I made design changes to make my dulcimers louder I was on the edge of losing the tone I prefer. It became clear that if I made louder dulcimers and wanted to keep the tone and responsiveness I prefer I would also need to give the dulcimers larger sound holes. The size of the sound hole(s) on a stringed instrument play an important role in which frequencies get emphasized or minimized. The most critical element is the total size of all openings on the instrument. One large hole will produce sound like two holes that are each half the diameter of the large hole, etc. Dulcimers have relatively little soundboard as they are long and thin instruments. I wanted the effect of larger sound holes but I did not want to lose any more of the wood that makes up the soundboard. The obvious choice was to put added sound holes somewhere other than on the soundboard. The sides were the obvious choice. And it worked! I got more volume, balanced tone, birds were singing, flowers smiled, and all was well with the world. Whatever is deposited in the invisible world of innermost hearts is manifested in the visible world of phenomena.